For those unfamiliar, Setster has been operating in the somewhat unsexy scheduling software space since 2008, with the goal of bringing doctors, lawyers, therapists, stylists, and everyone in between, a platform that makes it easy to manage appointment scheduling. Setster wants to be anywhere service providers make appointments with clients — enterprise or SMB. As the daily deal space has become increasingly crowded over the last two years, local merchants feel pressured to run deals, but for many reasons, they end up overwhelmed by the prospect of managing those deals from start to finish, and the big deals players are failing to help them. Setster believes (and they aren’t alone) that there a few fundamental flaws to the daily deal ecosystem established by the LivingSocials and Groupons, including the fact that deal providers should be enable service booking immediately after customers buy a promotion, for the simple reason that, the more time customers are given to close the loop (book), the less likely they are to actually use the merchant’s service. Merchants also need a way to optimize their calendars so that they can book deal customers during off-peak hours. The very nature of deal customers makes them less profitable clients for merchants, so merchants need a way to fit deal clippers into their calendar in such a way as to prevent them from displacing regular, full-paying customers during peak business hours. Furthermore, promotions and deals require further data entry into calendars, managing reminders, cancellations, and rescheduling for merchants, so giving them a way to manage the influx of new business by automating the booking process within their calendars is imperative. And, lastly, as Setster points out, merchants want more granular feedback on the success of their deal and promotional campaigns, like booked appointments, up-sells, additional revenues, etc. Not just one-dimensional sales analytics. Ironically, as much grief as Groupon gets and is vilified, they were way ahead of the game in this regard. After buying OpenCal in December, Groupon turned it into Scheduler, a service that makes it easy for merchants to quickly close the loop between offer, booking, and scheduling — which it began rolling out to SMBs last month. With Scheduler, Groupon solved the mismanagement problem for its customers, giving merchants a free way to accept booking 24/7, add a “Book Now” button to their websites, and made it available to all merchants looking for online booking, whether offering Groupon deals or not. Plus, Scheduler offers client lists and business dashboards, which show realtime stats on total appointments, new customers, allow them to track redemption and view the percentage of bookable time filled. Again, as Setster points out, this represented serious innovation for the industry, and is unusual in the sense that, for once, it came from the top, rather than from a scrappy startup. However, Groupon is basically alone in offering this kind of functionality, as the other big deal players basically stand around and pick their noses. For those deal providers who can’t afford (or have forgotten) to buy their own OpenCal, Setster’s API provide an affordable (pricing info here), comprehensive, white label solution for daily deal companies. The company’s API is open and designed for use by any deal provider, across marketing channels, allowing them to integrate the scheduling solution both on their own websites as well as their merchant sites. Deal providers can add booking features inside mobile apps, directories, daily deal, group, and promotional coupons, so that end users can book directly from those offerings. By adding a booking feature inside mobile apps, directories, daily deal, group and promotional coupons, your end users now book directly from your offering. After buying, customers are immediately directed to schedule an appointment, which are pre-set by merchants with the times they want to accept deal customers and the service providers they want to use for the particular deal. Daily deal sites can re-sell the service through their own white label options, even offering it for free to their merchants as incentive to adopt or through available wholesale prices. Setster believes that its solution allows deal providers to offer easy scheduling options and increase the likelihood that vouchers are redeemed, converting sales for their merchants into repeat customers and up-selling more services. The big daily deal players aren’t doing all they can to close the loop between merchants and their buyers. Daily deal sites seem to forget that merchants are really what they’re selling, and it’s their job to give them all the tools they need to encourage repeat business. The happier merchants are, the more they use deals and promotions, the more revenue deal providers see as a result. Setster has given every daily deal site not named Groupon the ability to offer full-service scheduling, booking, and performance measurement tools. 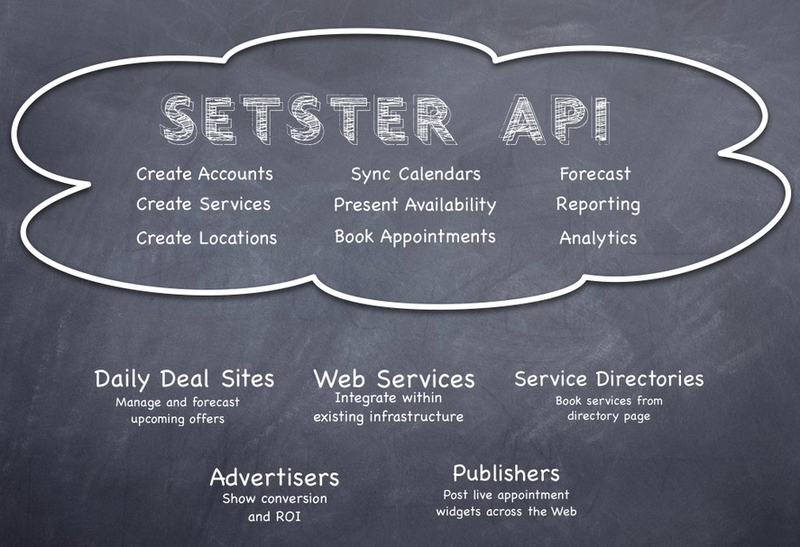 It’s not clear if local marketing companies, cough, daily deal companies, are listening, but it seems Setster’s APIs could have big implications for the space. For more on Setster, visit them at home here. Developers can download the Industry API white paper and sign up for private beta here.